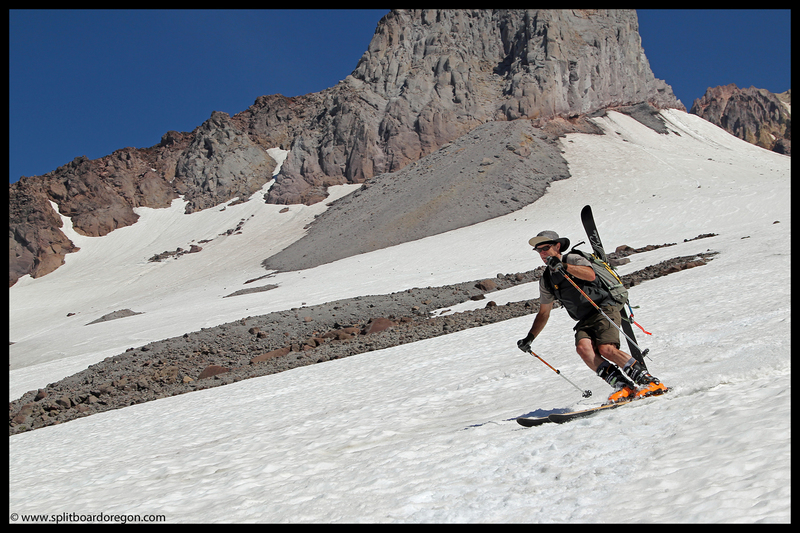 “Are you still interested in heading out for some August turns?” That was the question I asked Ron a few days prior to heading up to Mt Hood for a mid-summer tour. 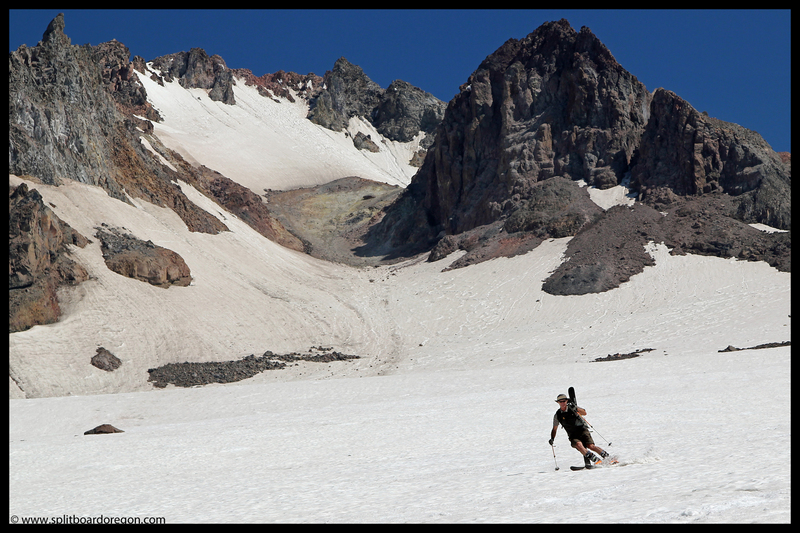 Normally I wouldn’t think twice about asking once someone commits to a tour, but it takes a different mindset to go skiing in the middle of the summer when the temps are hovering a few degrees below 100. 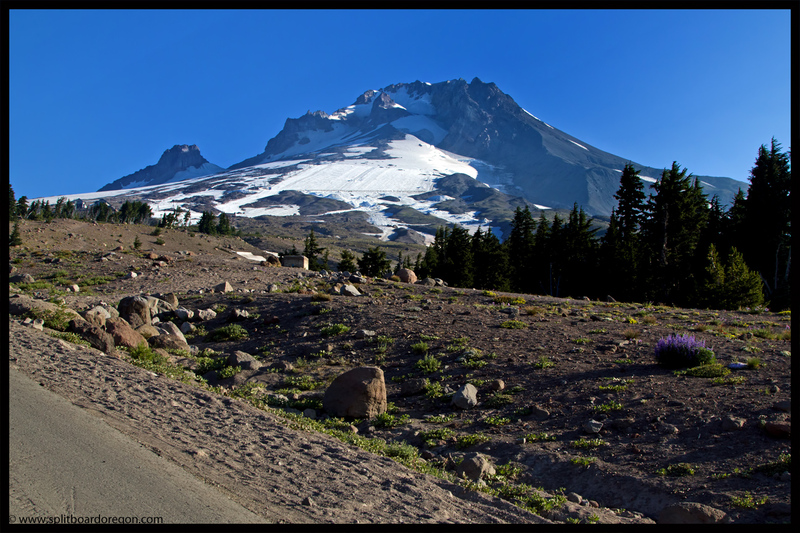 My alarm clock went off at 4am and 20 minutes later I was rolling north on Interstate 5, coffee in hand. After a quick stop at Ron’s to pick him up, and we made the short drive up Highway 26, pulling into the Timberline parking lot around 7:30. 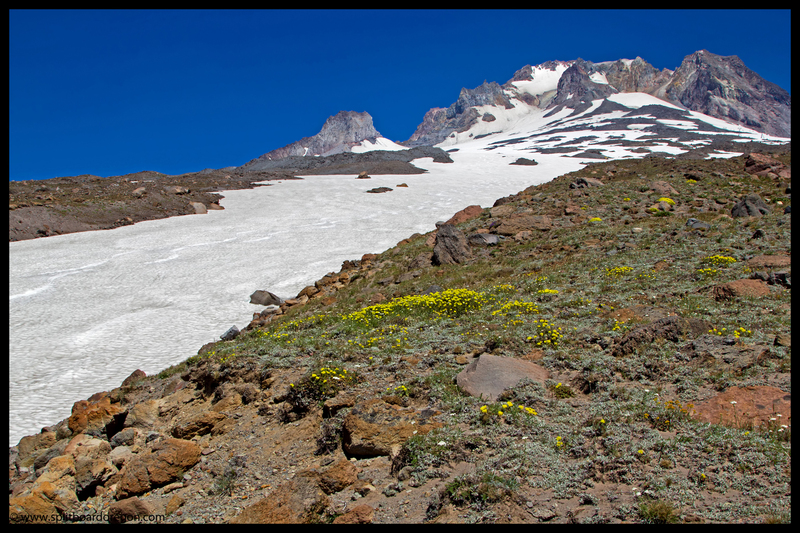 The sun was out and it was already t-shirt weather as we shouldered our packs and started up the paved path that leads to the Pacific Crest Trail. Snow coverage looked good for this time of year, and there was a definite haze in the air due to a few of the wildfires burning to the south…. Heading west up and out of the ski area, we soon found ourselves in the Little Zigzag canyon, which held good snow down to an elevation of 6700 feet. Once on the snow, we switched from hiking to skinning, making good time to our high point at Illumination Saddle, arriving shortly before 11 am. As usual, the snow below the saddle was littered with rockfall, and one really large rock that would ruin your day had just recently fallen, being covered with fresh snow after clearing a large path in it’s wake. Snow conditions were such that we were able to skin right to the saddle…. As usual, the views looking out over the Reid Glacier were outstanding. 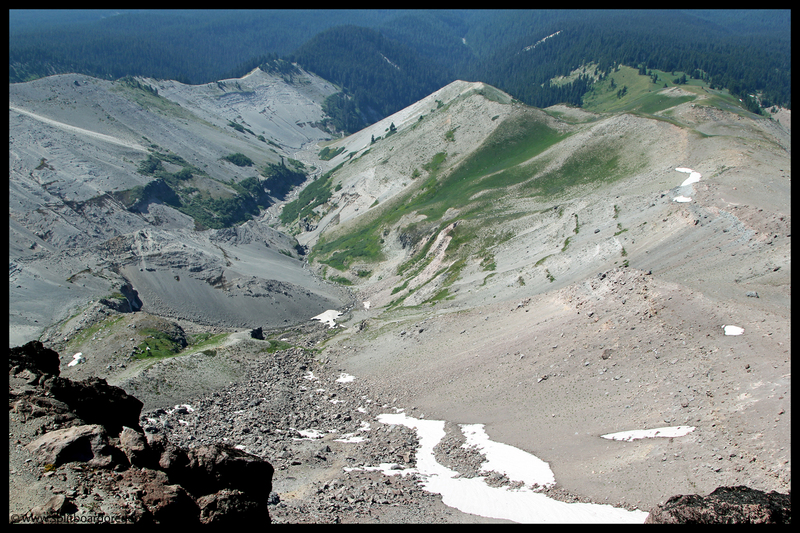 The character of the mountain changes drastically once you head west of Illumination Rock, the gentle slopes of the south side giving way to the steeper terrain of the west side, which includes the gnarly Yocum Ridge…. We spent a half hour or so soaking in the views and refueling with a quick lunch, enjoying the complete sense of calm at the saddle. 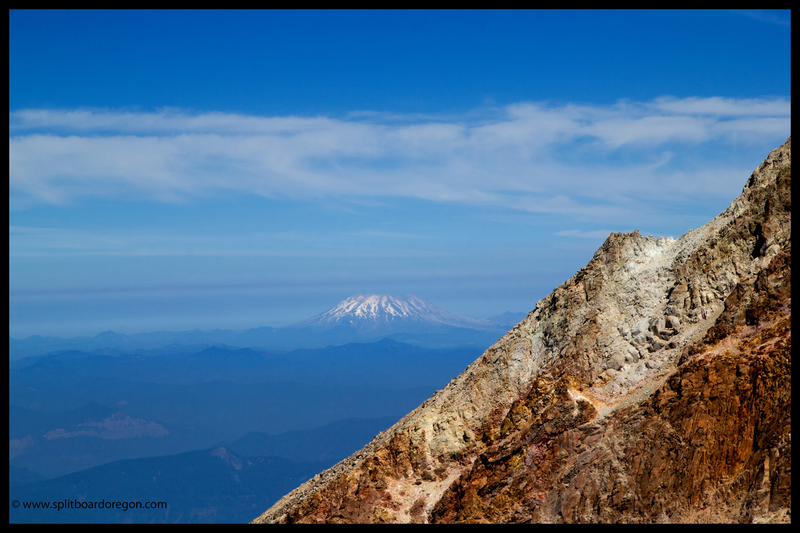 Looking to the south, just the top thousand feet of Mt Jefferson was visible above the smokey haze, though to the north we could see the entirety of Mt St Helens, which had shed much of it’s winter coat…. 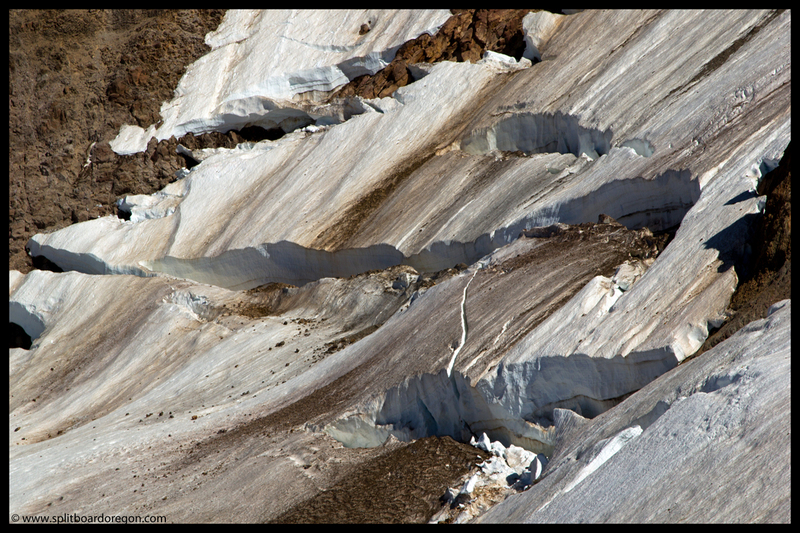 The maze of crevasses on the Reid are always something that capture my attention, and I find myself captivated by their beauty. The photo below shows some of the larger openings on the upper Reid and is a perfect example of why I feel the way I do…. 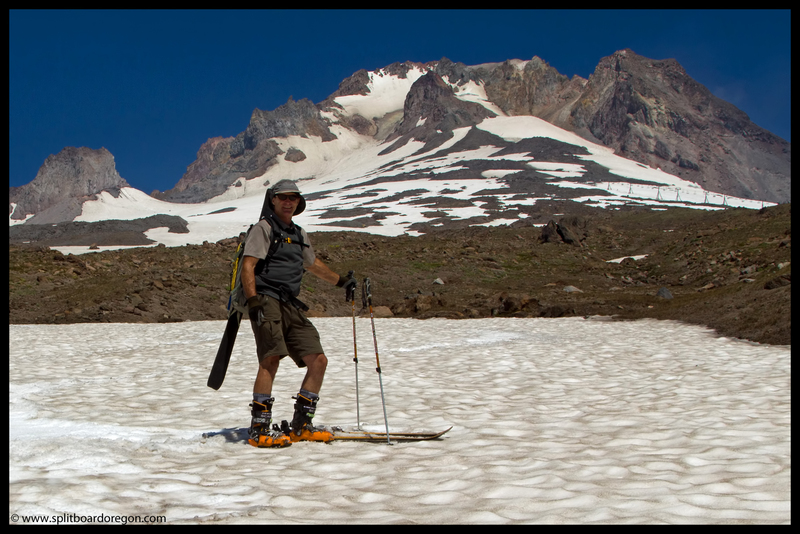 After dropping a few hundred feet on the Zigzag Glacier, I stopped to setup for a picture sequence of Ron and noticed a helmet laying on the snow, so I rode down to it and attached it to my pack. 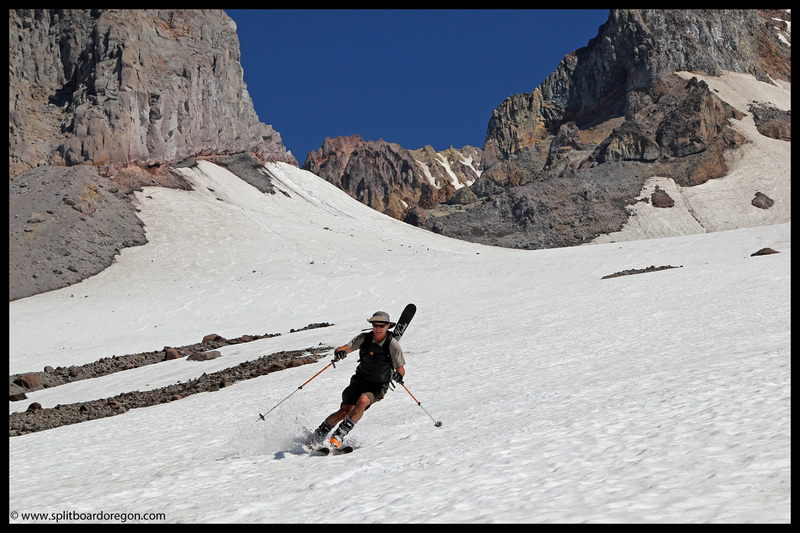 Looking back up at Ron, I wondered what he was doing – it looked like he was attaching his ski to his pack, which made little sense. I thought maybe he’d broken a binding or something. Then, he took off skiing towards me, so I picked up the camera and fired several shots in sequence. 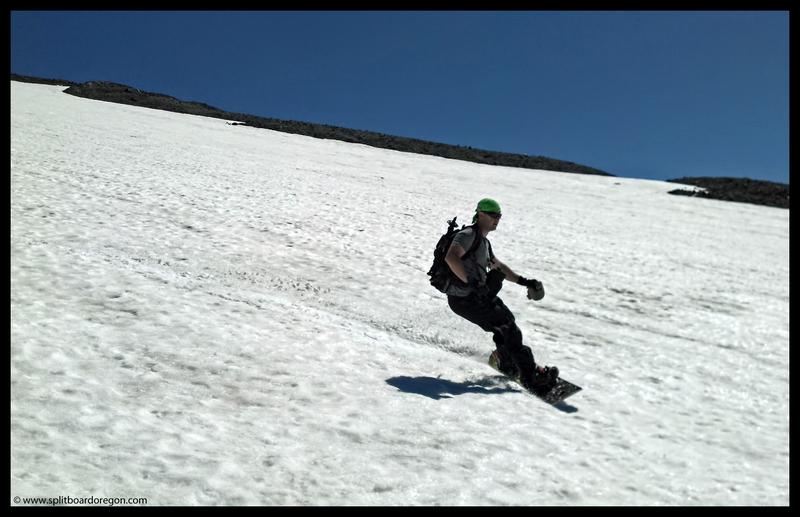 When he got down to me I showed him the helmet I’d found, not even noticing the extra ski on his back, which he’d found a few hundred feet above me. Comparing our findings it appeared obvious that somewhere along the line earlier in the season someone had a pretty bad day. The ski appeared to have been out in the elements for at least several months. 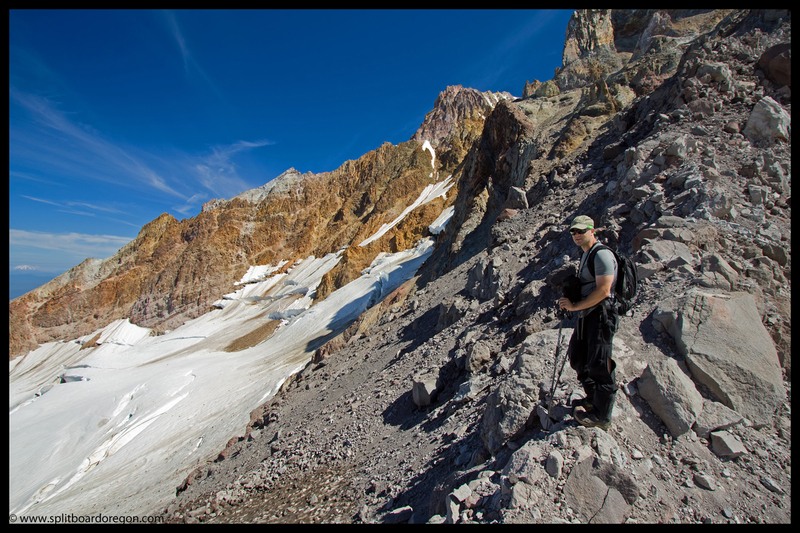 With our extra gear securely attached to our packs, we headed down the Zigzag for more turns…. Two skis on the snow, one on the pack! We made smooth turns down the entire length of the glacier, stopping at the end of the snow just prior to the head of the Mississippi Head Cliffs. Walking out onto the viewpoint overlooking the landscape below the Mississippi Head was quite scenic, and a good spot to sit and enjoy a snack while soaking in the views…. The view of the upper mountain from the top of the Mississippi Head isn’t too shabby either. 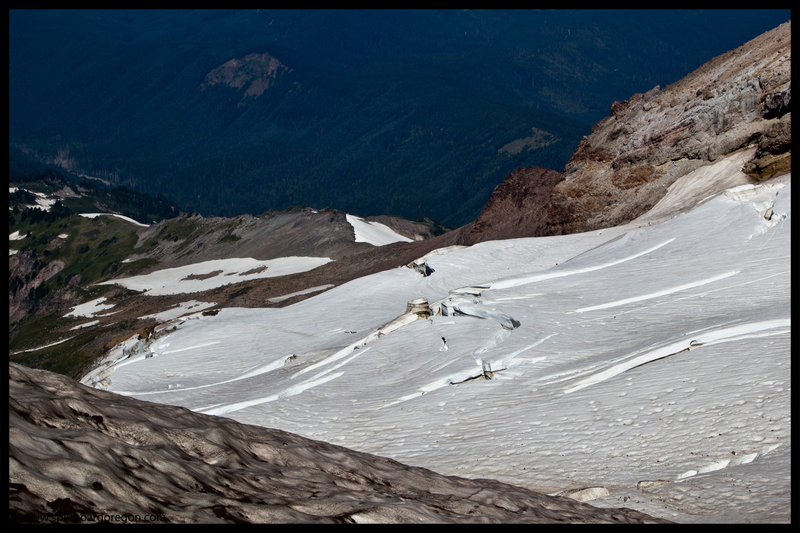 Looking back, the entire length of our ski descent was visible from Illumination Saddle…. After enjoying the views and rest, we headed back up the hill to get on course with the Little Zizgag Canyon. 30 minutes later with over a thousand more feet of smooth summer snow waiting below us, we strapped the boards on our feet for more turns. I always enjoy the fast smooth turns of the Little Zigzag. At the bottom of the snow, we exited the canyon and headed west towards Timberline, hoping to find yet more turns before the day was done in Sand Canyon. Sand Canyon proved to be worthy of quite a few more good turns, even if the snow was covered with a healthy dose of grit! 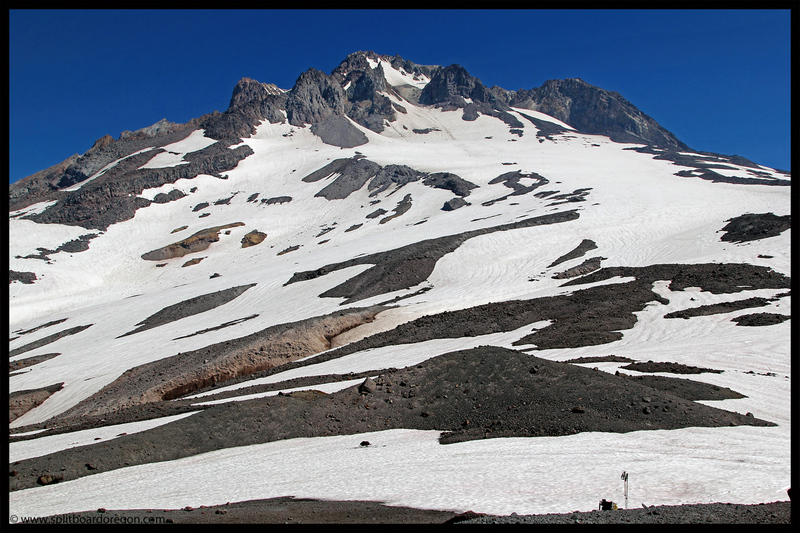 By linking a few snow fingers, we were able to descend to an elevation equal that of Timberline Lodge before stepping out of the bindings. 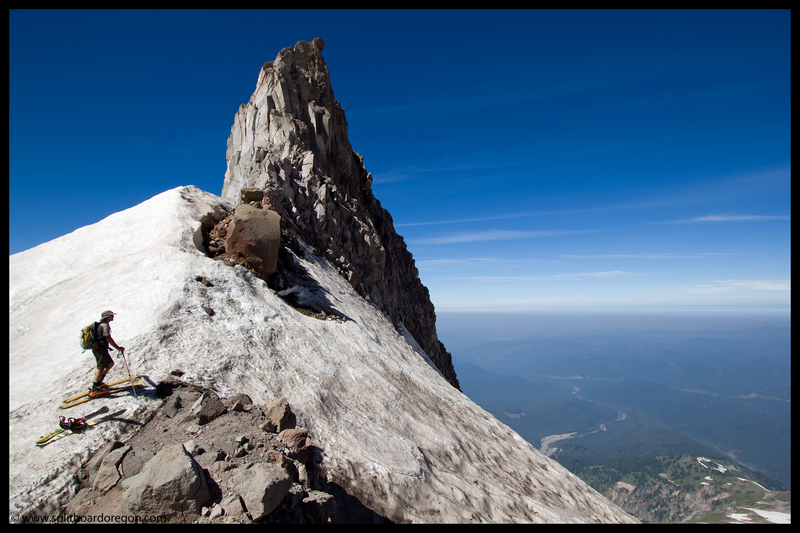 A short hike back to the ski area, and our summer ski day was in the books – nearly 4000 feet of vertical on the downhill….not too shabby for mid-August! Here’s a parting shot of Ron near the bottom of Sand Canyon….